As you many know, I have always been a fan of fixing something that is broken if possible rather than just tossing it and buying something new. There are so many reasons to do this: saving money (by at least delaying a purchase), throwing away less trash and just feeling good at the accomplishment. Recently my pool cleaner was not working and rather than spend $400 on a new one, I was able to buy all the replacement parts and essentially rebuild the entire thing other than the case itself for $80, and some of you may have read about my restoration of a friends 1960’s floor lamp. Awesome, right? 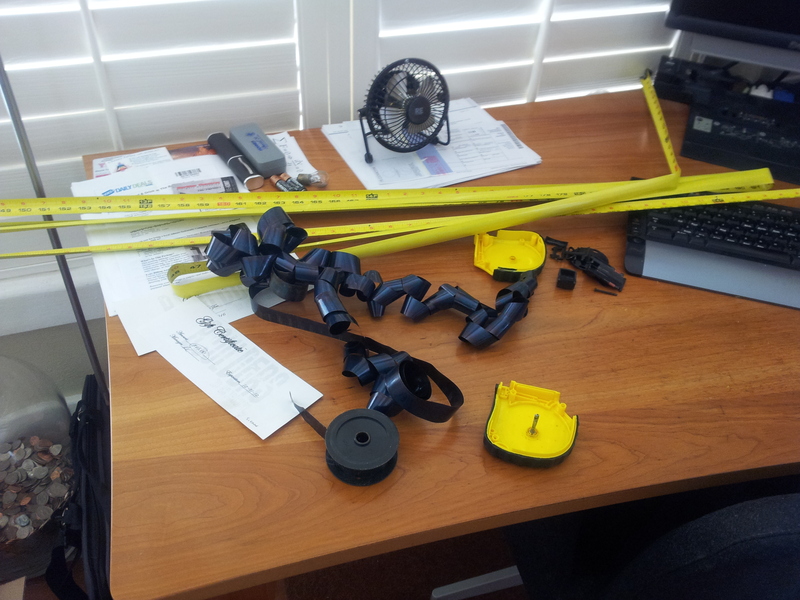 No big deal or big cost, but I was using my 25-foot tape measure recently to measure something damn near 25 feet long. I should say that a 25-foot tape measure is really a 20-foot tape measure, since taking those last five feet out often results in it not going back in again. As was this case. No problem; I’ll fix it! I took it apart, knowing it would need to rewind the spring in it. I started winding it back up, checking to see if it had enough winding to pull the tape all the way in when I heard a loud SNAP, which was the spring breaking near the end. Well crap, looks like I’m not fixing this. What I was unprepared for was what was left of the wound spring essentially EXPLODING out of the case when I went to set it on my desk. I’m glad I was clear because the edges of the spring are razor sharp! Moral of the story: Much like in life in general; we can’t fix everything. Been there, done that. When a tape dies, it’s dead. garage door springs are pretty powerful also, which is why I call Smokeys Garage door repair. That is why one should not own a garage. They are too dangerous for the human race. Don't leave a techo-geek alone with expensive medical equipment.